THE LIVESTOCK ANSWER®, also known as ‘Nature’s Very Own Probiotic,’ is a microbial driven formula that provides enhanced nutrition through overall digestion to support optimum health and performance of production animals of all shapes and sizes. 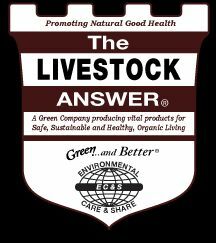 Unlike other probiotic and enzyme products, THE LIVESTOCK ANSWER® is not a pill or an injection. It’s an all natural probiotic, enzyme and digestive aid dry feed additive that supports an animals overall gut and digestive system– stimulating their natural immune systems, reducing or even eliminating the use of antibiotics. After all, 70% of an animals overall health is based off their digestive system.